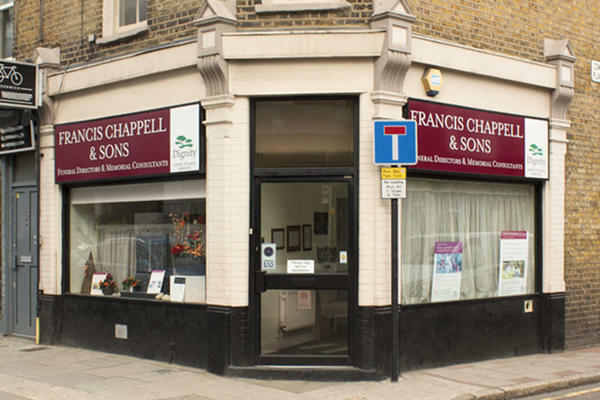 Francis Chappell & Sons Funeral Directors in Greenwich strive to provide the local community with compassionate and dignified funeral services. We help to arrange all kinds of funerals from traditional religious ceremonies to the more contemporary woodland burials. Whatever you feel is right for your loved one's farewell, we can help make it happen. We have a rich heritage spanning over 175 years, and as a Dignity funeral director we can utilise our vast knowledge and experience to deliver the perfect service for your loved one. We understand that it can be difficult to arrange a funeral, which is why we want you to know that we are here to help you at every step. You can rely on us to give you our full support and any guidance you might need. We are here for you, every step of the way. Please call us today on 020 8858 2966 at any hour. Armitage Road has free parking. The car park on Park Row (SE10 9NL) is open 8am-6pm for £2.50 per hour; it is 15 minutes walk away. We are opposite Costa, the nearest station is Maze Hill. Our staff are available 24 hours a day on 020 8858 2966 if you require our services outside of these hours.